In the Edwardian era, the first motorised fleet! 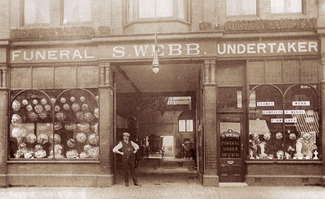 Our Company was founded in 1894 by Sidney Webb in Upper High Street, Wednesbury where our head office and chapels of rest can still be found today. Sid soon gained a reputation for having the finest Belgian Black Horses to lead his bespoke Victorian Hearses and mourners carriages, This is a reputation that has carried on through the generations and our current fleet of Jaguar XJ hearses and Limousines are amongst the finest funeral vehicles in the country. 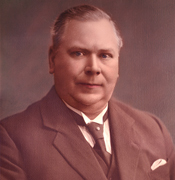 Sid retired due to ill health shortly before his death in 1941 aged 68 years and the company was passed down to his daughter Edith and Son-in-law Fred Ward who ran the business up until the late 1970’s. Fred’s passion was Rolls Royce vehicles especially Phantom V1 and Silver Cloud Hearses and Limousines which became a trade mark of Webb’s throughout the 70’s and 80’s. Upon Fred and Edith’s retirement in the late 70’s their son Trevor, who with his wife Avril, had been involved with the business from the late 60’s, found himself Chairman and Managing Director, with Avril becoming Company Secretary, a position she still holds to this day. Trevor and Avril had four sons and one by one they have joined the company. Trevor passed away in 2006 aged 66 years and the company was passed down to the boys. 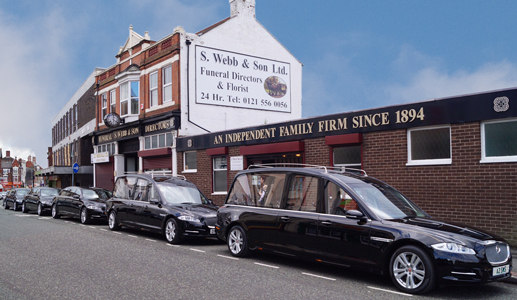 Our Head office is situated at 17, Upper High Street, Wednesbury in the town centre as are our chapels of rest, workshop, mortuary and garage facilities. 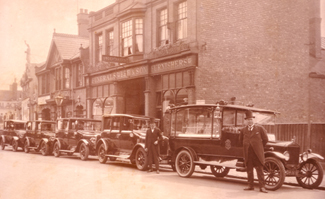 This branch office which we opened over 40 years ago is situated at 5, Church Street, Darlaston directly opposite St Josephs Roman Catholic Church, The office is managed by Julie Davies who’s caring manner has helped hundreds of Darlaston families arrange their loved ones funeral for 18 years. St James House, 70 Hill Top, West Bromwich has been one of our branch offices since 1965 located on the cross roads of New Street and Hill Top, It was also the family home of Trevor and Avril until the mid 70’s and the birth place of Johnathan, Tim and Toby. This office is only manned on a part time basis and a call to head office is advised before visiting.